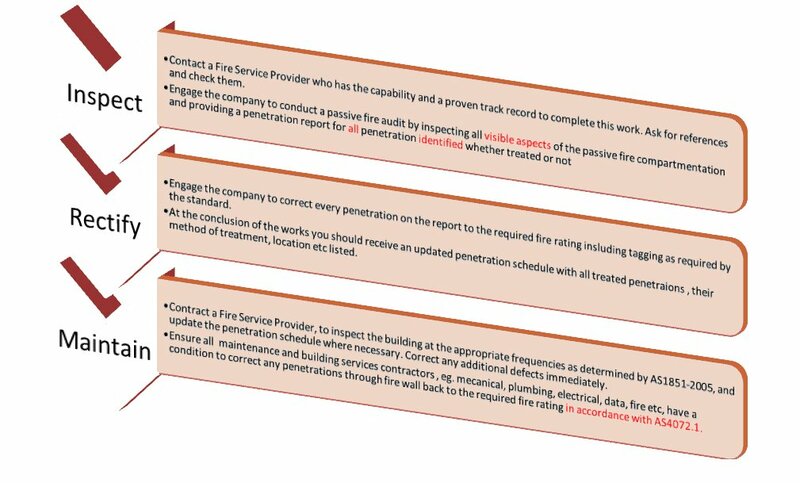 AS1851-2005 ‘Maintenance of Fire Safety Systems and Equipment’ determines that all buildings should have their passive fire penetrations and compartmentation provisions maintained and inspected and that a penetration schedule is established to assist and record this maintenance. This area of fire maintenance is a specialist field that Wormald is well equipped to provide. Passive fire protection management is a part of building maintenance which is all too frequently overlooked; often due to a lack of accurate information about what might be required. There seems to be a recent trend, amongst building owners, facilities managers and the like, towards finding out more about passive fire protection management, perhaps driven by the terrible fire in November last year at a Quakers Hill Nursing Home. In my experience building owner/managers are confused and disillusioned about their passive fire protection requirements so I will discuss what passive fire compartmentation is, how you can get on the right path and who can help you get there. Fire compartmentation is an enclosed compartment or chamber within a building that has been specified fire rated. By “fire rated”, for simplicity’s sake, we mean the length of time the fire can be contained within a substrate such as a wall or door. Put simply, if a fire starts in that compartment, it should be able to be contained there for a period giving the occupants and fire brigade more time to safely evacuate and negotiate the fire. Typically fire compartments will have a number of penetrations. Penetrations are holes, breaks or gaps in the fire wall e.g. doorways, air conditioning ducts, plumbing pipe-work and electrical/data cabling. The effectiveness of the fire compartmentation is only as good as its weakest part, therefore penetrations must be identified and treated to maintain the fire rating of the compartment; otherwise a fire may be able to rapidly engulf the building, endangering lives. Even the tiniest opening can cause significant issues. The diagram below outlines a process for helping to get your passive fire requirements in order (click on image to enlarge). Following this process can be the most effective way of saving lives in your building during a fire; protecting you, your organisation, your staff, clients and visitors. You have a legal obligation to ensure your building’s fire safety systems and equipment is maintained and performs in the manner to which they were installed. This entry was posted in Passive fire protection by wormaldblog. Bookmark the permalink.